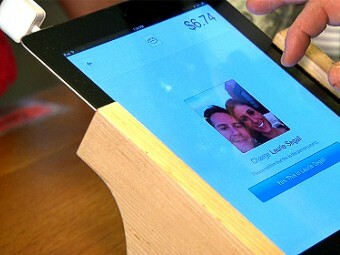 Square became famous for its small, white iPhone and iPad add-ons that lets merchants swipe credit and debit cards. Phase Two of the company's vision is to wipe out hardware entirely: Its Pay with Square app lets you walk up to the checkout and pay by simply saying your name. It sounds like science fiction, but it's catching on fast: Square says 75,000 merchants nationwide are already using the system. You can find nearby Square-enabled merchants through the app. Before you duck into one, click "open a tab." Then put your phone away. "I'd like a scone, and my name is Laurie," I said. The clerk clicked my photo on his iPad to charge me, and the transaction went through. All I needed was my name. I'll admit, it was pretty cool. In a recent interview, Square founder Jack Dorsey told me that future of mobile payments lies in technology we barely notice. He envisions tools that "go into the background, so people can focus on what's most meaningful to them." Square's definitely got "wow" factor -- and a few small glitches. Café Grumpy's barista identified me by my picture but mentioned that many peoples' images are blurry. And if a big crowd of Square shoppers hit a venue at once (imagine trying to use this system for the iPhone 5 launch), things could get dicey. I wouldn't be thrilled if someone slightly similar looking used my name to pay.